It’s been five years since I last saw Shakespeare’s history play “Richard II” at Shakespeare & Company in Lenox, Massachusetts. That was a modern-dress edition with all of the flaws and imperfections that a smartly played update can possess along with some extremely strong performances, most particularly the title character played by Rocco Sisto. Prior to that it had been about 30 years back to the previous incarnation. Now, in Ghent, New York, there is a new Richard, set in its own historic time, played by the David Anderson, founder of Walking the dog Theater, which is presenting it in the Hawthorne Valley Waldorf School Hall on a three-quarter thrust stage. Under the sharp and precise direction of Melania Levitsky, Anderson and company are working wonders with a heavily cut version of the play (running just over two hours, about an hour and 20 minutes shy of the complete play) that brings the story to vivid life. There is so much poetry and beautiful language in this play that to have the words less than perfectly spoken is a problem. However, the performance of the Queen by Taipei actress Yuan-rong Liao Anderson, while not always word-intelligible, was among the most moving interpretations I have ever witnessed. In expression, gesture and movement, this beautiful young woman conveyed every emotion and sensual expression necessary to show the impact of the play’s story on a heart that is moved to an overwhelming extent. It was one of the things I will always relish having witnessed. Carla Lewis plays two roles handsomely. She begins as the Duchess of Gloucester and her scene is brilliantly played. Again, there is a sensitivity in her playing that is simply matchless. She then morphs into Northumberland, whose scenes are legion and whose strength and sincerity Lewis brings forward beautifully. TAMIR plays the Duke of York and seems to never leave the stage, which was fine with me for her work in this role is exemplary. The same can be said for John-Scott Legg’s Henry Bolingbroke. Here we have the most masterful scoundrel in all of Shakespeare’s works. He is a banished nobleman who breaks the bounds of his sentence to take the crown, although he hides behind a righteous countenance in order to do so. Legg gives the man a charming presence and even a sympathetic one at times, which is a remarkable achievement in a character whose scruples were left by the side of some road somewhere in Wales. The balance of the company does remarkably well in their roles, most particularly James Kuhn as the Duke of Aumerle. It is the King, Richard II, who must carry the bulk of the play, and David Anderson seemed quite up to the challenge. A bit fey in a group of elaborate costumes that seem more Fellini-esque than necessary, he becomes a take-charge monarch in the second half when he relinquishes his crown to his cousin-rival Bolingbroke. In the remarkable Act IV scene, Anderson proves he is a most capable and honorable actor, taking the stage away from Legg and then leaving the other man with both the burden of power and the equally stiff burden of performance. His crown tossed aside, Anderson proves there is weight in the hollow, shallow stream of consequences that follow. Serena Hoffman’s straightforward set design works well for this play and Sean Madey’s simple lighting was most effective. The costumes did their work, defining the characters visually, even Anderson’s Richard II. They were created by Elizabeth Frishkoff, Hsiu Hsin Chuang, Betsy Blair, Rose Lehrman and Dove Frishkoff. Gotthard Killian’s music was effective, sometimes odd, sometimes lyrical. One of the least performed Shakespeare plays, this edition is worth a trip out to the Columbia County valley on Route 21C. 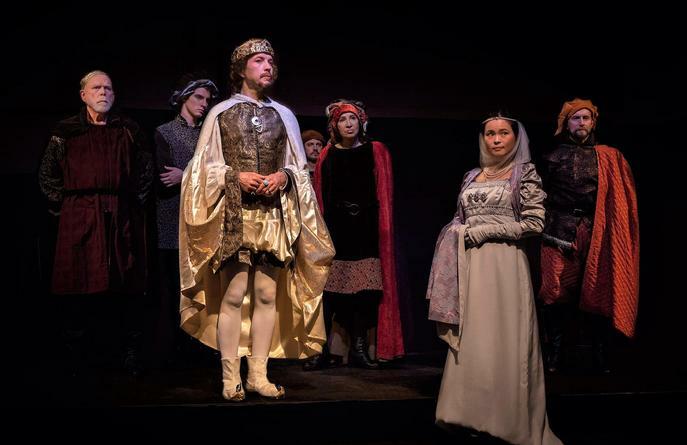 Richard II plays at the Hawthorne Valley School Hall, 330 County Route 21C, Ghent, New York, through Sunday, July 29. For information and tickets, see the Berkshire Edge calendar, go online to www.wtdtheater.org or call (518) 392-3399.